We are still focusing on the numbers 1-5 this week. 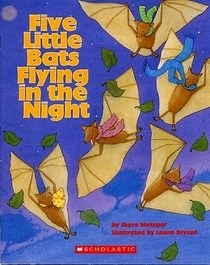 We read the book Five Little Bats Flying in the Night. Then we acted out the story and made up our own story problems. We counted forward and backward. Worked on the concepts of number conservation and cardinality and decomposed the number 5. Then we used an activity from Kim Adsit's Have a Blast with Bats! unit. We made bat caves and worked individually to decompose the number 5. I really like Kim's recording sheet because it does not have equations on it. We have not introduced equations yet in our curriculum so this sheet is perfect. It uses pictures to have students write how many bats are in the cave and how many flew out into the night. At Children Academy, your child is the focus. We never forget that they are the reason that we are here. Our programs create an opportunity for each child to attain their full potential and achieve their dreams as well as yours for them. Your bat cave for the children is so cute and creative. What a great way to practice number sense. I have used the book, but have never thought of creating a bat cave in the classroom. Thanks for sharing!